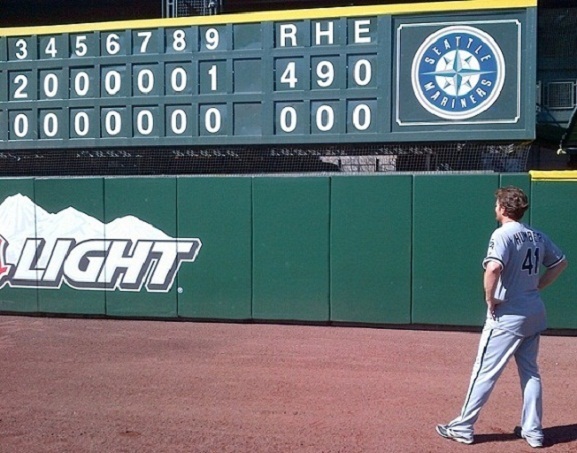 Earlier today, Chicago White Sox right-hander Phil Humber pitched the third perfect game in franchise history, mowing down the Seattle Mariners 4-0 at Safeco Field. It was the 20th regular-season perfect game in major league history, and amazingly enough, it came from a guy who had never pitched into the ninth inning in his career, let alone thrown a complete game. As usually the case, his place in history was ensured only after a pulse-pounding ninth. Humber went 3-0 on Michael Saunders, the first hitter of the inning, before battling back to strike him out swinging. John Jaso then flied to right for out number two. With Humber only one out away from perfection, pinch-hitter Brendan Ryan went to a 3-2, count, fouled off a pitch, then struck out on a checked swing that he vehemently argued. Catcher A.J. Pierzynski had to retrieve the ball and throw to first for the final out. It was Humber's 9th strikeout of the contest, and it came on just his 97th pitch. A relatively low number for a complete game. "I'm just so happy. There's so many good things happening right now and this adds to the list," said Humber, whose wife is expecting. Humber was originally drafted by the New York Yankees in 2001 but didn't sign. Instead, he went to Rice University where he helped pitch the Owls to a national title. The New York Mets made him the third overall selection in the 2004 draft, only one pick after the Detroit Tigers selected Justin Verlander. But while Verlander's career took off, hardly anything went as planned for Humber. He had Tommy John surgery in July 2005, which slowed his development. After appearing in just 5 major league games in 2006 and 2007, the Mets traded Humber to the Minnesota Twins as part of the February 2008 deal to acquire ace Johan Santana. Humber would appear in just 13 games over two seasons with the Twins before they released him. The Kansas City Royals picked up Humber in December 2009, and he appeared in 8 games in 2010 before they waived him in December 2010. Claimed by the Oakland Athletics, he was on their roster exactly a month before they opted to waive him in order to give his spot to Guillermo Moscoso. Finally, in January of last year, the White Sox claimed Humber and he emerged into a solid starter, posting a 3.75 ERA and 9-9 record in 26 starts in 2011. Now, less than a year later, he's become a most unlikely part of baseball history.